Imagine a Venus flytrap, now stack 10-15 of them on top of each other, remove the roots, shrink the whole thing to about 6 inches, and submerge it all in water. What’s the result? 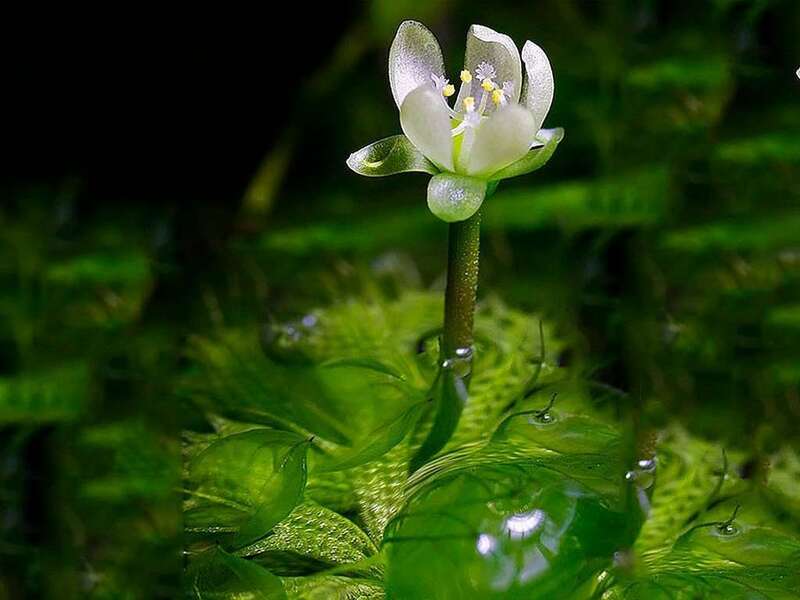 – The waterwheel plant, Aldrovanda vesiculosa. 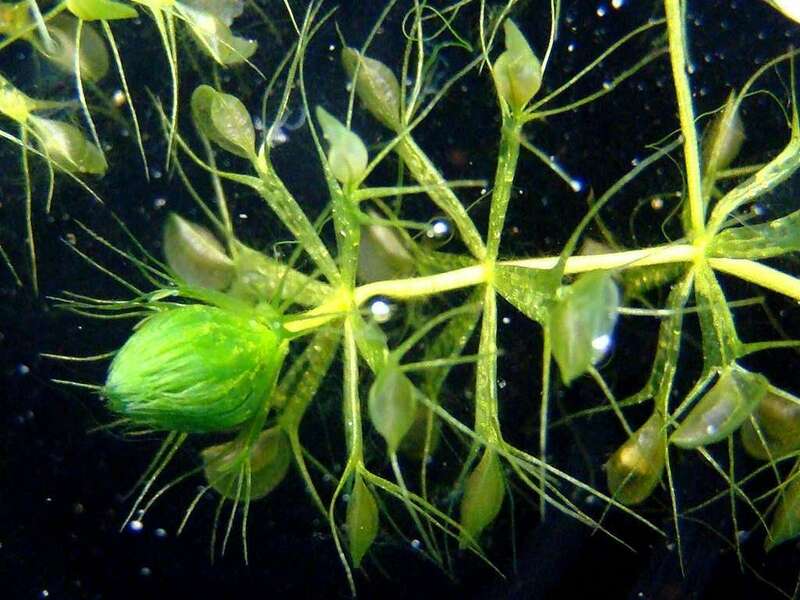 This curious plant is an aquatic Venus flytrap in both spirit and genetic reality. They have analogous trapping mechanisms, albeit on a smaller scale, and submerged in water. 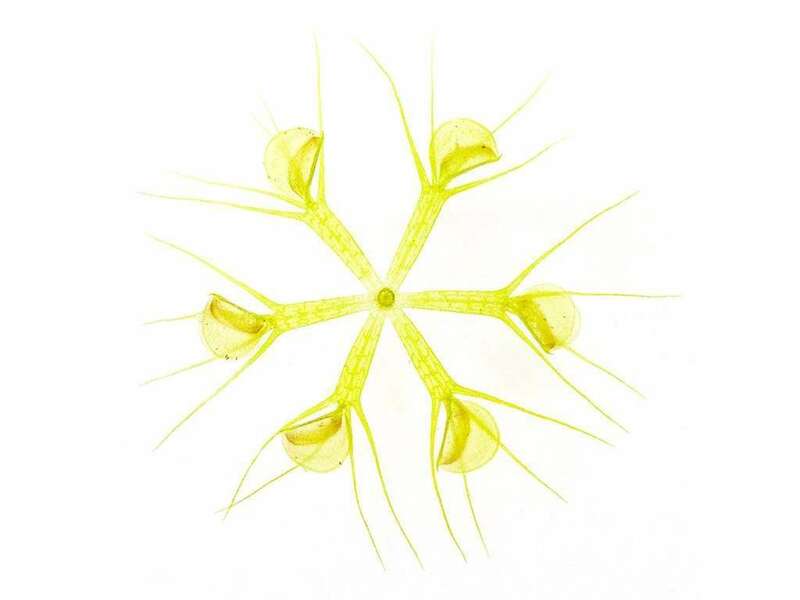 Waterwheels feed on small prey like eelworms and daphnia that venture into their traps and bump into trigger hairs. Like a few other carnivorous plants, Aldrovanda vesiculosa is the only plant within its genus. The plants are rootless, and free-floating with old vegetation dying back as new vegetation grows from the opposite end. -Like a never-end feather boa… with, uh, carnivorous leaves. 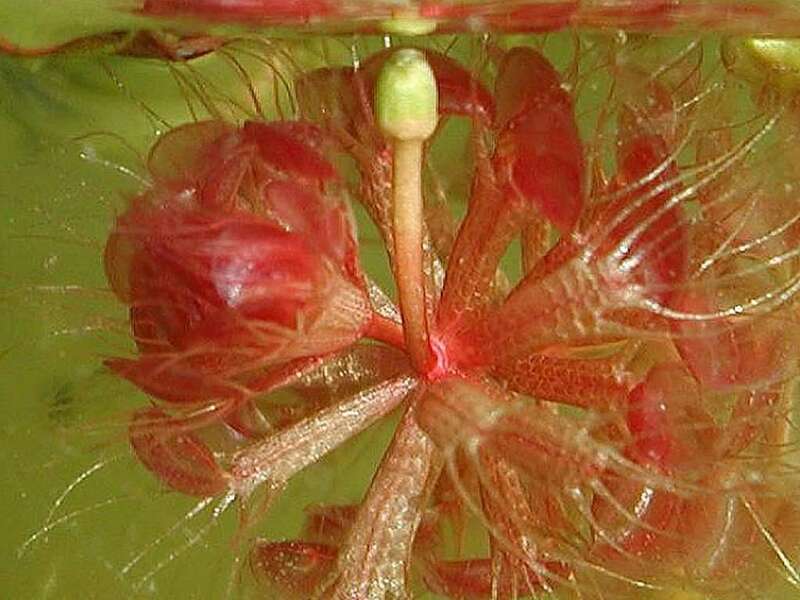 The traps of Aldrovanda vesiculosa look like small (1/12 inch), translucent flytraps appearing at the end of a broad petiole. Surrounding the trap are hair-like bristles that prevent the traps from bumping against other aquatic plants and getting damaged or falsely triggered. The outer edges of the trap lobes are lined with many hook-like teeth (analogous to the flytrap’s teeth) that interlock when the trap closes around prey. Within the trap you’ll find around forty long trigger hairs (imagine the 6-to-8 trigger hairs inside a Venus flytrap trap) that, when stimulated one-or-more times, cause the clam shell trap to snap shut. Alongside the trigger hairs, there are digestive glands that secret acids used to break down a prey’s soft tissues for absorption. Traps seal around unfortunate prey using a combination of the interlocking teeth and mucus sealant, forcing it to the base of the trap, nearest the hinge. At this point, the trap forces out much of the water and replaces it with the digestive juices. Like a flytrap trap, each Aldrovanda trap can catch 2-4 meals before calling it quits. Unlike Venus flytraps, there’s no known lure to attract insects to the traps. Aldrovanda vesiculosa naturally grow in acidic ponds and lakes in Africa, Australia, Europe, India, and Japan. They float just beneath the surface of the water among other aquatic plants that provide a source of CO2 that helps the plants thrive. In temperate climates, waterwheels will go dormant in the winter, forming tight turion buds. Turions are wintering buds that become detached from the main plant and remain dormant at the bottom of the water until improved conditions trigger new growth. However, plants growing in the tropics will have vegetative growth all year and won’t produce turions. These carnivorous plants are rootless (hence the floating) and produce 4 to 8 inch stems from which leaves radiate around. This structure is commonly referred to as a whorl. While one end of the stem grows, the opposite end dies back, maintaining a constant overall length. Unfortunately, the plants are endangered in Europe due to pollution and have gone extinct in Japan in recent years. The Waterwheel plant is wholly aquatic species, so the only thing that ever pokes out of the water is the flower. It produces a single white flower atop a short peduncle that branches off of the main stem/whorl of leaves. This solitary flower only opens for a few short hours. Once closed, the flower is drawn back into the water where seed production occurs. The seed leaves, or cotyledons, remain within the seed coat and act as a source of energy storage for developing seeds. Flowering, in general, is rather rare, especially in temperate regions. They infrequently pollinate and produce seed, so your best and quickest bet for propagation is to divide Aldrovanda vesiculousa. See below for details on easily dividing the plant. Aldrovanda got its name through a rare scientific typo. I’ll explain. Aldrovanda was discovered in 1699 by Leonard Plukenet in India. Decades later in 1747, Italian botanist Gaetano Monti described the plant as Aldrovandia using plant specimens collected by Dr. Carlo Amadei near Bologna. Gaetano named it Aldrovandia as a way to honor the Italian naturalist Ulisse Aldrovandi. Unfortunately Linnaeus biffed the spelling years later, accidentally misspelling the name as Aldrovanda (notice the lack of an “i”) in his 1753 book Species Plantarum. The name stuck. Whoops. 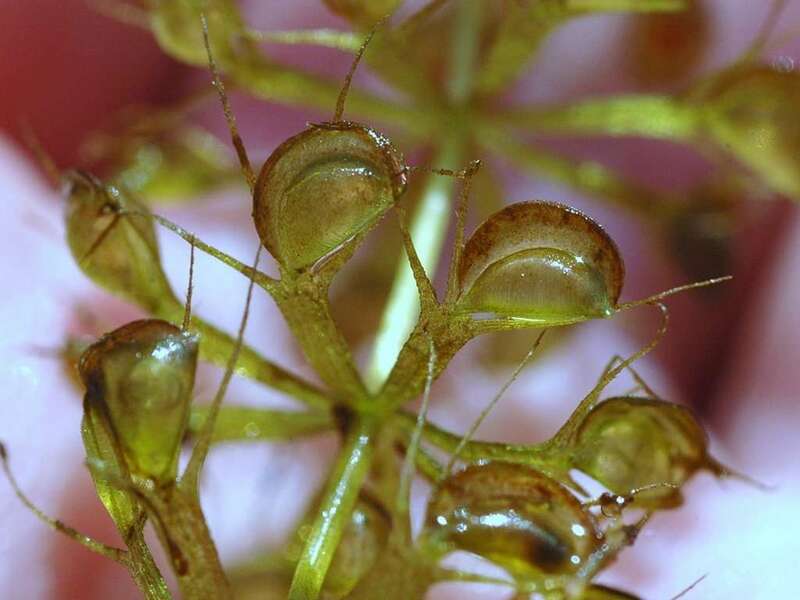 The flytrap-like snapping behavior was observed by De Sassus in 1861. Darwin’s work later hypothesized Aldrovanda’s carnivorous behavior. Today we know that waterwheel traps produce phosphate-digesting enzymes, and when traps are fed radioisotope-tagged Daphnia, they digest and absorb the prey. 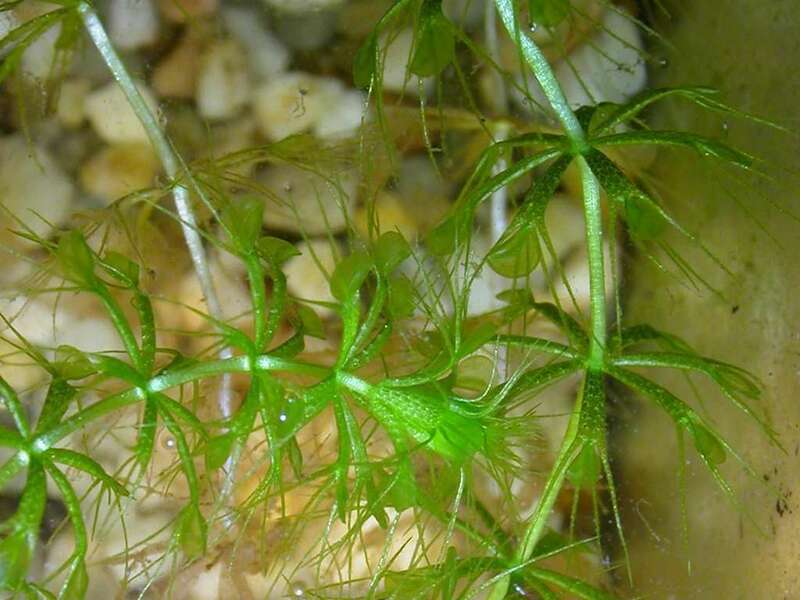 Aldrovanda can be found in ponds and lakes in numerous spots around the world. Primarily, we’re looking at Africa, Australia, Europe, India, and Japan. Unfortunately, waterwheels are endangered in many natural habitats. Make sure you’re getting plants from a reputable nursery that doesn’t poach plants from their natural habitats! Aldrovanda are wholly aquatic carnivorous plants, and don’t require soil. That said, they enjoy floating in somewhat acidic water, so having settled peat moss at the bottom of a habitat is a good idea. Shallow plastic containers 6-8 inches deep will best mimic the shallow edges of ponds where waterwheel plants hang out in natural habitats. Give the plants at least a 1 square foot area to float in. Guess what? Aquatic plants don’t need watering! One less thing to worry about. For water that the plant floats in, use distilled or reverse osmosis water. This can be inexpensively purchased in most grocery stores, or you can invest in a reverse osmosis (RO) filtration system that hooks up to a sink (bonus – this also provides great drinking water for humans and pets). Waterwheel plants enjoy full sun. If outside, the water will naturally attract aquatic critters that act as food. If indoors, I recommend introducing eelworms or water daphnia. You can do this by dipping a cup into a local stream (freshwater, and not agricultural runoff which will have a ton of fertilizer in it) to collect “nature.” Pour this water in with your Aldrovanda water. This will seed the life needed to feed your plants. No special transplanting techniques. Simply remove them from existing water and place them in a new container. Just make sure the plants have a couple of feet to stretch out in. While not a traditional “division,” Aldrovanda can be easily propagated by breaking the main stem in half or just above the small offshoots that frequently form. Both ends should grow healthy plants. From whence there was one, let there be two!Because the plant grows so quickly, propagation via divisions is easy and fast. You can’t exactly take “cuttings” of waterwheel plants, but see above “divisions” section for something that comes close. Seed production is rare in cultivation, and you’ll develop mature plants faster from divisions. I am not aware of any tissue culture experiments with Aldrovanda. Given how easy it is to divide them, I’m not sure there is a material benefit in attempting tissue culture. Algae is the scourge of Aldrovanda. To stymie algal growth, introduce water fleas, tadpoles, and even mosquito larvae (ugh). All will eat algae and mostly avoid eating your waterwheel plants. Mostly. Smaller larvae and water fleas will also act as a food source for your plants. To avoid hatching adult mosquitoes, place a fine mesh screen over your water basin. This will trap and drown adult mosquitoes and keep out other outdoor pests. They are warm-temperate plants enjoying warm-to-hot summers and cold winters. Tolerant of light frost but not of water freezes. Aldrovanda do great outdoors in direct sun, and can survive frosts in the winter. Avoid conditions where water freezes solid, and remain diligent in fighting algae growth. You can grow waterwheels in water basins inside of greenhouses. Watch out for algae growth. Terrarium? More like aquarium, given the aquatic nature of Aldrovanda. Remember to keep water relatively shallow at 6-8 inches. Will thrive in sunny windowsills. Consider a decorative glass water basin for best viewing angles of the plant, and to let in maximum amounts of light. Great candidates for bog gardens in warmer climates. Remember to keep water shallow-ish. Frost exposure is fine, but avoid conditions where water freezes solid – this will kill your waterwheel.